Striking the right balance; tough, reliable, rugged. Handles rocks and so much more. 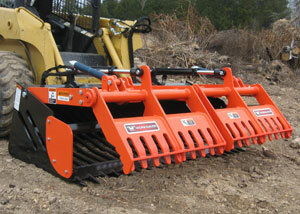 Revolutionizing the way rock grapples and rock buckets work, the SARG® (Sweep Action Rock Grapple) makes life easier. Patent pending design allows the skid steer operator to own one tool to sort large or small debris, resulting in lower cost of ownership. The SARG is not just another grapple. It will replace a traditional rock bucket (skeleton buckets) plus a root or rock grapple. The 66-degrees of sweep moves rocks of varying sizes into the rock bucket and retain them there. The SARG will also handle brush, logs and stumps, replacing your brush grapple, allowing it to be a multi-purpose tool. The SARG is the best grapple you will ever own. SATG-series with its open tine bottom and sweep-in grapples offers the performance customers demand for site demolition debris, as well as rocks, brush, wood and metal. 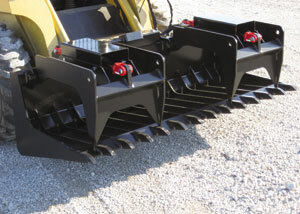 SASB-series features our scrap yard tested solid bottom low profile bucket. The bucket bottom is made from abrasion resistant steel with three ½” x 4” reinforcing wear strips on the bottom for longer bucket life. The attachment that started it all, the Split-Top grapple rake is designed for use on tractor front loaders as well as skid steers. Available in two widths, 62" and 77", these units feature two upper grapples working independently of each other, allowing the unit to retain uneven loads. These root grapples feature upper clamps to retain material that is picked up. 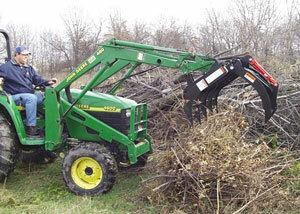 They are the prefect brush grapple for clearing fence rows or picking up brush and tree limbs. The 1-inch tines with replaceable wear points allow the unit to pull small roots from the work area making these split-top brush grapples time savers. 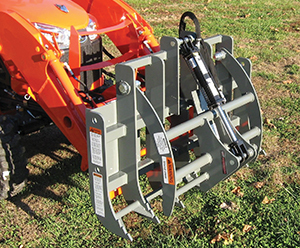 Designed for compact tractors up to 50 engine horsepower that are equipped with a front loader, this 60" wide utility grapple allows the acreage owner unsurpassed versatility in clearing brush, piling limbs or orchard maintenance. The root rake with 34” wide single upper grapple is equipped with 3000 psi cylinder and is great for clearing fence rows. The replaceable wear points allow the operator to get under debris, picking it up while leaving the dirt behind. This brush grapple is sized to work with a compact tractor, allowing the large property owner to get more done in a day’s time. Designed for handling debris, brush or orchard prunings. The CTMG-48S & CTMG-48JD grapples are designed for compact tractors up to 38 HP that use the “universal” skid steer quick attach system or the John Deere 200/300/400 attaching system, allowing the operators to easily change from the bucket to the grapple. 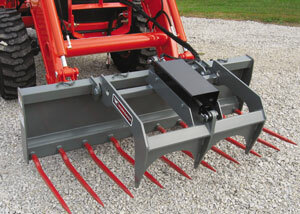 The 31” wide single upper grapple is made of 3/8” material while the lower 48” wide rake has tines made from ½” material. Both the upper grapple and lower rake feature gripping notches to help retain loose materials. Simplicity with strength and capacity best describes our Sub-Compact Mini Tine Grapples. Engineered for sub-compact tractors (up to 32-hp) equipped with a loader to handle debris and so much more — the SCG-48S & SCG-48JD are changing the way properties owners are cleaning up. This 48-inch wide grapple with either “universal” skid steer hook-up or John Deere Series hook up offers the operator the ability to own a job matched tool to collect debris, firewood, brush or orchard prunings, resulting in time savings and low cost of ownership. Designed for Skid Steer loaders, the SSGR-84 features a lower profile design than standard brush grapples making access to the operator’s seat easy, even on units with a cab door. Lower tines with gripping notches of 1” material with weld-on tine points allow the grapple to pick-up debris while leaving the dirt behind. The dual upper grapples open a full 59-inches allowing the operator to maximize the amount of debris held. Two 2” x 10”, 3000 psi cylinders are mounted behind the mainframe to operate the upper grapples, while protecting them from harm. Hoses are routed through the mainframe providing protection for them. Designed for skid steers, the LPSB series scrap bucket attachment is scrap yard tested to provide material handling on the farm or construction site, easily moving demolition debris, rocks, brush, and dirt. Ideal for storm clean-up, landscaping, or moving hard to handle materials, this solid bottom grapple is tough and reliable. Two independent grapples help to secure uneven loads. Solid bucket features skid runners of abrasion resistant steel, extending the life of the bucket. 3,000 psi cylinders with cylinder guards to protect the cylinders and components are standard. Hoses are equipped with hydraulic flat-face couplers. To protect the hoses they are routed through the back of the scrap bucket. The skid steer scrap bucket's cutting edge is drilled to accept an optional replaceable and reversible beveled cutting edge which provides increased bucket strength while extending bucket life. Attachments designed for skid steers, the LPTG series tine grapples easily move rocks, brush, wood, metal and other materials while leaving the dirt on the ground. Offered in three sizes, 72”, 78” and 84” these skid steer loader tine grapples help you get more done.The tine spacing on the bucket allows dirt to fall through while the industrial duty bucket holds the rocks and debris. These tine grapples are ideal for various applications including construction site demolition and clean-up, storm clean-up, and landscaping. The tine grapple features include 5-½" tine spacing, 3,000 psi cylinders with cylinder guards to protect the cylinders and components. Hoses are equipped with flat-face couplers for quick hook-up. These tine grapples for skid steers are built for the way you work…tough. Designed for use on smaller skid steers (and compact tractor front loaders) utilizing the "Universal" skid steer attaching system, our ETG series out performs other light duty grapples. Also available for John Deere 300/400/500 series loaders, these economical root grapples are easy to use and are ideal for raking, piling and loading brush and other hard to handle materials, while leaving the dirt behind. We are the leader in compact tractor utility grapple rakes with tough reliable and rugged models at an economical cost to own. 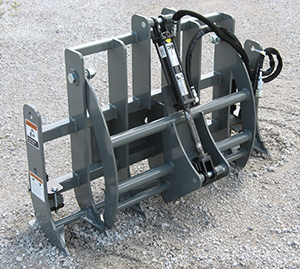 Designed to mount to a skid steer loaders or tractor front loaders with “universal” skid steer attach for picking up manure, matted straw or other loose materials. Replaceable foraged cranked tines are mounted to a solid steel bucket shell for added strength. 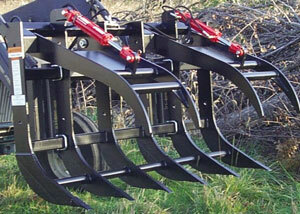 These utility manure forks produce cleaner barns or stalls with less physical effort. Excellent for handling silage, upper grapple helps secure load during transport improving productivity. Models with upper grapple can also be used for picking up tree limbs, brush, loose hay or other debris, increasing their versatility. Worksaver knows...Pallet Forks. 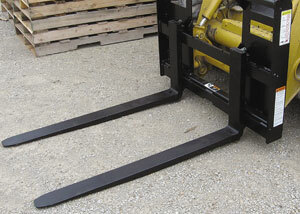 Designed for skid steer or tractor front loaders our pallet fork product offering has forks rated from 4,000 lbs. or 5,500 lbs. All models feature solid steel alloy forks for long life, with spring loaded latches for easy adjustment spacing. The pallet forks easily move along a machined beveled edge rail. Allowing you to find the right spacing to handle bulky, bagged or palletized material with your skid steer or tractor loader. 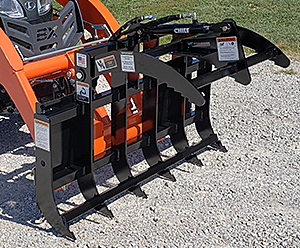 Our line-up of pallet fork attachments includes the SSPF-series for Skid Steer Loaders or tractor front loaders that utilize the “universal” skid steer attaching method. The JDPF-series with integrated attachments for JD 400/500 series loaders as well as models for JD 600/700 series loaders. 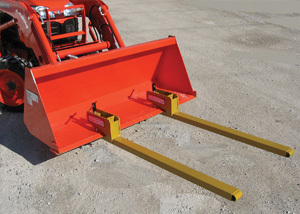 GLPF-series is offered for tractor loaders that use the Euro/Global tool carrier. No matter what your lifting needs are Worksaver has the answer. Don’t let their small size fool you. 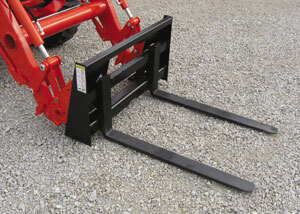 These pallet forks are designed for compact tractors up to 40 horsepower equipped with a front loader. The frames incorporate many of the durability features found in our larger units. Class I solid steel alloy forks are easily positioned along the machined beveled top rail. Rating is 2,000 lbs. making them excellent for moving palletized material, saving time and effort. 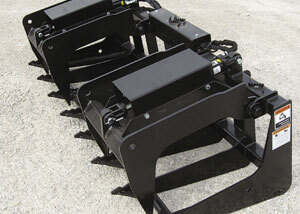 Models are offered with “universal” skid steer attach as well as John Deere 200/300 series attaching system. 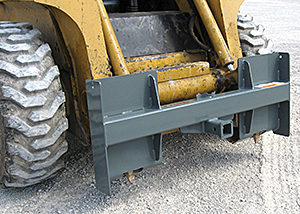 For other loader models our FLPF model & bolt-on interfacing brackets are the logical choice. 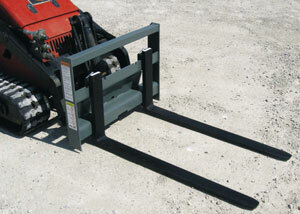 Value performance best describes these sub-compact pallet forks. 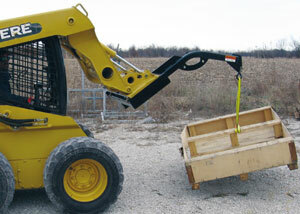 Designed for loaders with skid steer quick attach on Sub-Compact tractors up to 35 hp. 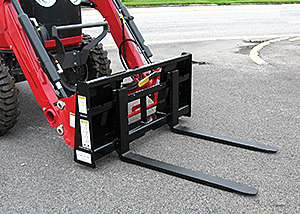 Pallet forks designed for Mini Skid Steers / Compact Tool Carriers fit Toro-Dingo®, Boxer®, Ditch Witch®, RAMROD and many other units. Rated at either 1,200 lbs. or 2,000 lbs. their all steel construction offers the large property owner an outstanding value. Model MPF-2000 utilizes Class I solid steel alloy forks to easily handle palletized items. These adjustable mini pallet forks are also available for Bobcat MT-Series (MT-50, MT-52, MT-55) allowing those owners to use them for a variety of material handling jobs. These pallet fork attachments are everything your job site needs. 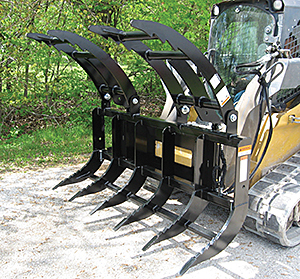 Clamp-on Bucket Forks are built to meet the demands of today’s acreage owner. Sturdy construction provides outstanding performance over years of service. Easy on/off design of the unit sliding over the cutting edge offers the utmost in convenience when moving palletized materials. Forks extend 14.5 inches under the bucket and 8 inches inside the bucket for support. Completely independent from each other this allows the forks to be adjusted to any pallet width. Each fork features a built-in stake pocket for a 2x4 to be installed as an upright backstop. A fast and economical way...to get more done. The SSTB-3500 Crane Boom is ideal for lifting or moving objects such as balled trees (tree boom), bundles of material (crane boom) or equipment on a job site (boom pole). This rugged lifting boom features three lifting points for increased flexibility in loading and lifting. Boom is 3-inch square tubing stock providing strength and durability. Overall boom length is 59.25-inches allowing plenty of reach, yet maximum capacity. Tough yet lightweight grapple delivers high performance on the job site. 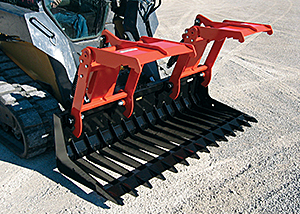 Designed to fit Toro-Dingo®, Boxer®, Ditch Witch® and RAMROD mini skid steers. 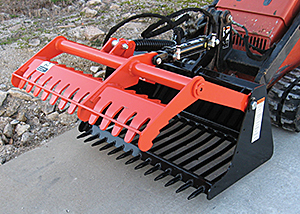 Unit features lower root rake with upper grapple to allow the unit to clear brush, pile limbs and orchard pruning, debris or other hard to handle material. Rugged all steel construction, 3000 psi cylinder, hoses and couplers are standard. 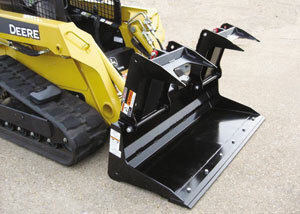 A model is also offered to fit Bobcat® MT-series as well as Gehl® 1640E.